The BOGE PSA oxygen generator allows you to generate oxygen exactly as you need it, thus freeing yourself from fixed and inflexible supply contracts. Supply problems and the risks involved in handling and storing high-pressure tanks are a thing of the past. Evaporation losses are avoided and no residual quantities of oxygen are returned unused in the bottle. Instead, you generate your oxygen exactly where it is needed, without any storage or rental costs. 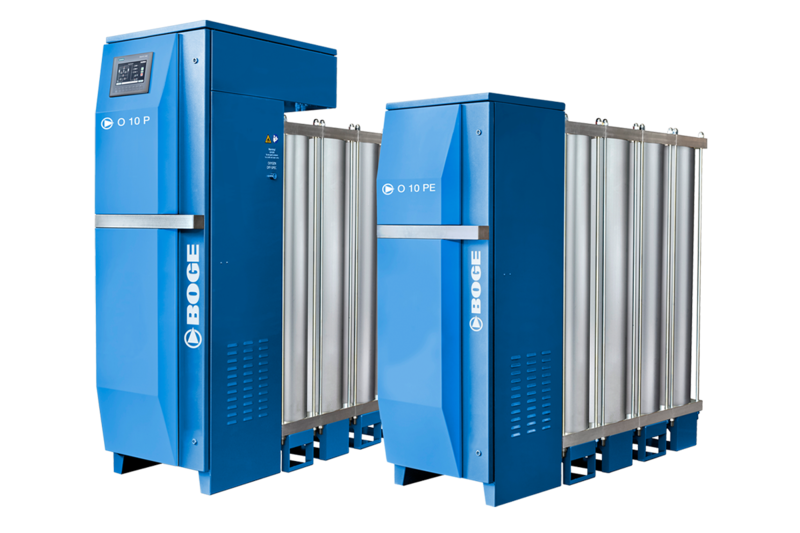 Thanks to BOGE’s highly flexible system, you can generate oxygen at purity levels between 90 and 95% and are no longer tied to purchasing your supplier’s high purity class oxygen. With BOGE PSA oxygen generators, you avoid the risks associated with storing high-pressure cylinders and handling oxygen bottles. All of the components used are of the highest quality and the manufacturing process is rigorously monitored. The analysis device and display constantly monitor the purity level and guarantee safe reliability. Thanks to their high-quality components, BOGE PSA oxygen generators are practically maintenance-free. The stainless-steel valve housing, the wear-free zirconium oxide sensor, and the zeolite molecular sieve ensure trouble-free operation and reliable oxygen quality. This means minimum service costs. BOGE PSA oxygen generators place particularly high demands on the treatment components on the product gas side. 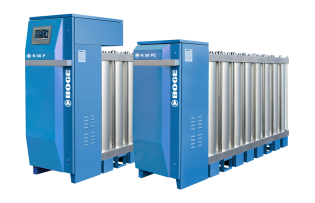 As a system provider, BOGE offers you a comprehensive range of products, whether you need sterile filters for the medical sector, for example, or specially coated oxygen gas receivers. BOGE PSA oxygen generators are fitted as standard with a Siemens S7 interactive 7” control unit with user-friendly touchscreen display. All generators also include a pressure sensor at the oxygen outlet. The innovative “cycle time shifting” function, available as an option, enables the container volume to be reduced. The oxygen production system can be expanded flexibly at any time, without having to disassemble the bank, since the additional modules are simply screwed on. This modular concept avoids the risk of contamination of the zeolite material within the individual modules. If the master bank is already fitted with six modules, up to three parallel slave banks can be added, again with one to six modules each. This allows you to produce an output of between 2.49 and 62.4 Nm³/h, depending on the required purity level. The output can be further increased, as required, by adding additional complete systems. The overall system can be centrally controlled from the master unit. The Pressure Swing Adsorption process is used to separate oxygen from the other components of the air: purified compressed air is passed through a receiver that contains a zeolite molecular sieve (ZMS) and the nitrogen molecules in the air are adsorbed by the ZMS. As soon as the ZMS is saturated with nitrogen molecules, the system switches over to the second receiver, in which the adsorption process then continues while the saturated receiver is regenerated. This process is repeated in every single module. The result: oxygen that has a stable purity level of 90 to 95%, or is just as pure as you actually need it to be. Only the use of BOGE original parts will enable you to benefit from the technological edge of the O-series in the long run. To this purpose, CRU AIR + GAS offers individually customized replacement parts for the O-series guaranteeing 100 percent quality and 100 percent service life. Only such original parts are compatible with the compressors of the O-series for maximum safety during the entire service life period. Please visit the Manufacturer’s website for more information and specific data sheets.